Compare fractions, identify equivalent fractions, and recognize that 3/3 is equivalent to whole number 1 on a number line. 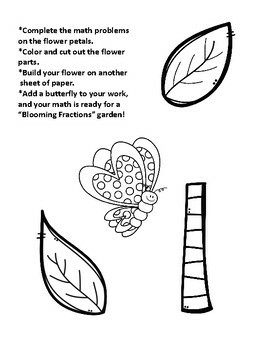 GREAT for math centers or stations. 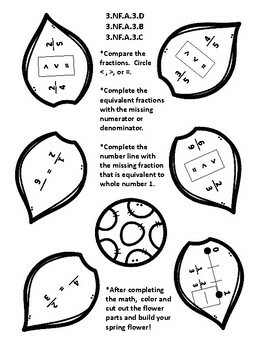 Each student will "build a flower" that has a fraction problem on each flower petal. SIX flower petals; ONE math problem on each petal to solve. 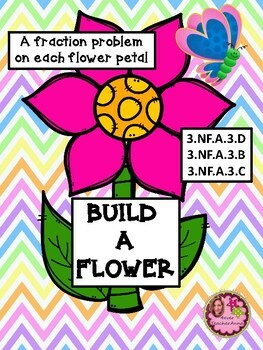 In addition to the "math", the completed flowers will make a beautiful bulletin board in your classroom! Your students will love these! • Go to your My Purchases page and beside each purchase, you'll see a "Provide Feedback" button. Click it and you will be able to give a quick rating and leave a comment for the product. Each time you give feedback, TPT gives you credits that you can use to lower the cost of your future purchases. I appreciate your feedback! • Look for the green star next to my store logo, and click it to become one of my followers. You will get TPT updates about my store, and I'd love to have you as a follower!